Faced with the uncertain future of sugar maples, eating maple creemees whenever possible is an imperative. 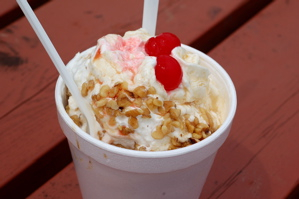 Sugar shacks dot the countryside, and if a sign and an arrow point the way to a creemee, I am there. Soft vanilla ice cream swirled with this year’s maple syrup — what better way to celebrate summer in Vermont? 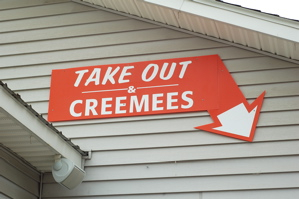 If you’re picky about such things as real ingredients (and you must be if you’re reading this blog) then be sure to ask at the creemee stands if they use real maple syrup. If not, well…there’s always another sugar shack further down the road. In the village of Barre, pronounced â€œbarryâ€ as I was gently reminded by a local, an especially memorable variation appears in the guise of a maple sundae. At the window of Caesar’s Fare, where a red siren light promises rescue from snack attacks, you can order two scoops of maple-walnut ice cream topped with maple syrup (Grade B = â€œBetter & Bolderâ€) and more walnuts. The bitterness of the nuts balances perfectly the sweetness of the syrup. Whipped cream and maraschino cherries complete the experience. Another local flavor comes from a metal tin. 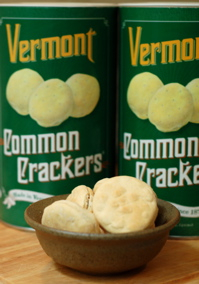 At the other end of the sensuality spectrum, dry and crisp Common Crackers have sustained generations of Vermonters. Round, puffy and neatly halved like a French macaron, they’re the New England embodiment of pragmatism. Originally purchased annually by the barrel, these crackers served as breakfast when soaked in milk, lunch when nibbled with cheddar cheese, afternoon tea when spread with jam, or dinner when served with chowder. Common crackers are descendants of the long-lived, well-traveled hardtack much-maligned by sailors and soldiers, and their close cousins include pilot crackers, water crackers, and sea biscuits. Recently revived by the Orton family, owners of the Vermont Country Store, the crackers are still available 180 years after they were first cut and baked in Montpelier. I’ve been enjoying my mini-barrel of common crackers with shards of Grafton Village’s six-year cheddar cheese in between my maple creemees. Who cares about crumbs in the car or lactose intolerance with the open road ahead? Stay tuned for an update next week from Maine. If all goes well, I’ll be posting photos of freshly dug steamers and buttery lobsters. In the meantime, please feel free to share coordinates for your favorite lobster shack along the Down East Coast!